I am always excited to share with new South Dakota agriculture teachers about how the South Dakota FFA Foundation supports local FFA chapters in gaining stability and growing their programs. In just a few weeks, our Foundation board will have their annual planning meeting. It is always inspiring to see FFA supporters gather in one room to brainstorm and plan for our next year. The enthusiasm for FFA and the efforts this group puts forth to raise funds and ensure a successful program for our Ag Ed students and FFA members is amazing. You, as a donor, can help with those efforts, in many ways that I don't often go into great detail about. You can give to your local chapter and help members across the state! If you feel passionate about FFA, there are various ways you can give back. While cash gifts are the easiest to understand - write out your check or make your donation online through PayPal - there are many other easy ways that anyone can donate. Planned gifts are another way to make a significant impact on South Dakota's agricultural youth. Designate the SD FFA Foundation in your will or donating a piece of personal property, such as land or a vehicle, are excellent ways to make an impact and have great tax benefits for you, the donor. Did you know you can even make a gift that pays you income through its lifetime? The options for giving to charities are endless and I'd love to visit with you more about the various ways and the impact your gift can have on FFA across South Dakota. If you'd like to learn more, simply email gerri@sdffafoundation.org and I'll gladly answer your questions. Thank you for your time, talents and treasures dedicated to growing FFA members! You never know when your small contribution will make a world of difference. 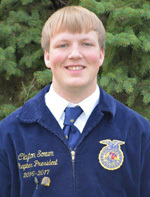 Clayton Sorum, Canton FFA graduate says, “FFA is more than just an organization, it’s one family all connected. When that family comes together, it has the potential to accomplish something that almost no other organizations in the world can - that is building the leaders of tomorrow. Thank you to the sponsors who help bring us together!” EVERY donation is valued by the SD FFA Foundation and the members it impacts. Don’t wait until you can give more, act now to make a difference. This year we’ve had lots Ag teachers retire, move or change schools this year. We also have 6 new schools adding agriculture education classes for the fall – Pierre, Yankton, Aberdeen Central, Belle Fourche, Bennett County, and Iroquois. Thankfully most of the positions have been filled for the 2017-18 school year. Sisseton, Bowdle, and Freeman are still looking for passionate individuals with an Ag Education background as teachers. If you know someone who’d be good, with an agriculture education degree, or an ag degree and past FFA experience, please send them to these schools. We don’t want to lose our valuable Ag Education programs! July 24-29 - State President’s Conference, Washington, D.C.
4:00 – 5:00 pm – FFA State Fair Ag Mechanics building will be open to bring entries in. August 31- September 4: SD State Fair, Huron - FFA/Ag Exhibit building and Ag Learning Center/Animal Nursery open to the public 9a.m. - 8p.m. 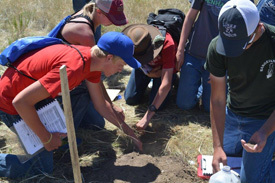 Congratulations to the SD FFA members who won at Rangeland Days and Soils Days June 21st in Wall! Over 100 young people were there to learn and grow. It’s a great way to prepare for the fall Soils and Range Contest . 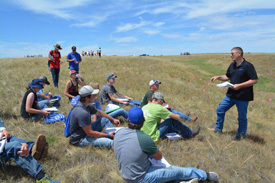 Thank you to David Ollila, Jeff VanderWilt, Lance Howe, the SD Grasslands Coalition, the USDA Natural Resources Conservation Service, and everyone else who helped for putting on a GREAT event for students and teachers to learn! If I were to ask you about your experience in Ag Ed or FFA, would you reminisce on your agriculture teacher first? Many times I find that a student has been impacted so much that the agriculture teacher is one of the first things to pop in their mind. Ag teachers wear a lot of hats, including teaching everything from animal science to welding, and being a mentor, coach, advisor and learner. They're working hard to not only prepare students for state convention competitions, but mainly to prepare students for careers in the agriculture industry and to be future leaders in their communities. Today, if you are a former FFA member, I'd like you to take a second to remember. I'd also encourage you to reach out to show your support for your local ag teacher. We have many teachers close to retirement, and lots of young teachers just starting and figuring it out. Thank them for being an expert in all agriculture, food and natural resources career courses, for putting in countless hours away from their families before and after school and for the continuing education they participate in to grow their knowledge of the industry. Tell a teacher thanks for all they do and let us share the story! 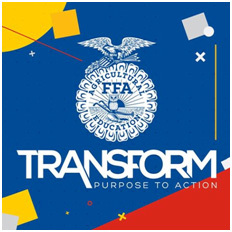 The SD FFA Foundation wants to reconnect with past members who believe in the future of agriculture... we know there are LOTS out there. It's more than just looking for financial supporters - it's finding people who will openly share with others what FFA has done for them. We need to share the message that we believe in the future of agriculture, just like the creed says. Please share names, addresses and/or email addresses of past members with: Gerri@sdffafoundation.org. We want to invite them to get active again as alumni by judging, coaching, mentoring, or financing local and state FFA activities. Celebrate summer as a family, group of friends or FFA chapter with a St Paul Saints game July 23rd. FFA guests are invited to a pre-game picnic starting at 3:30pm. Other activities for all ages! Game starts at 5:05pm! Buy & Print your FFA Day tickets online - visit: saintsgroups.com Password: FFA2017 (click here) to get tickets now! 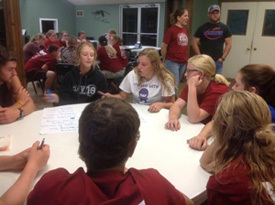 FFA members from across the state set goals to “Buckle Down” and lead as they learned how to identify their own strengths, personal worth, how to develop their leadership skills and how they could help advocate for the future of agriculture, one story at a time at this summer's two Leadership Retreats. Thanks to the Leadership Retreat sponsors for making it possible: SD Department of Ag, Twin Cities Region Northland Ford Dealers, Monsanto, Custer Mile High Garden Club, Curry Seed, AGNITION, Kibble Equipment, and Tractor Supply Company, SD Agri-Business Association, Farm House Fraternity – SDSU, US Army/Army ROTC. While student members were busy learning, ag teachers also attended an in-service. Did you know? 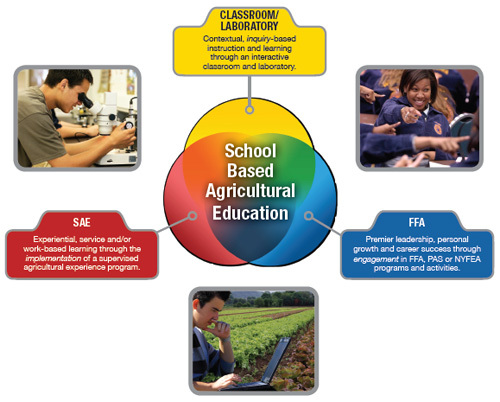 Collectively, FFA members across the nation earn more than $4 billion annually through their SAE projects.The three-circle model of Ag Education is an integrated approach in instruction, FFA and Supervised Agricultural Experience (SAE). And while most instruction and FFA events happen in the school year, many teachers end up spending their summer visiting students and their families about the importance of their SAE and value of FFA. This visit is a great one-on-one instructional opportunity. Teachers visit the site of the SAE, whether it's the family farm, a local greenhouse, an auto shop or a grocery store, and observe and educate students in the field. Often times, the focus is on educating students on the career pathways in agriculture, food and natural resources. While these visits can happen year-round, many teachers take their summer months to make deeper connections with students and make sure they continue learning outside the classroom. Were you once in the National FFA band, chorus or talent? Know someone who was? Did you watch them and marvel at their talent? SD FFA members just applied, with applications due July 10th. The SD FFA Foundation wants to offset the cost of SD FFA members participating in National FFA Band, Chorus and Talent programs. Approximately 80 students nationwide are selected for each band and chorus, and less than 50 for the national FFA talent program. 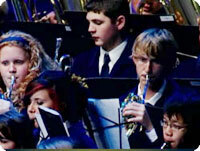 The hand full of SD students selected each year to participate truly stand out with their musical talent and dedication. These performers spend 7 days at the National FFA Convention site practicing hours on end and performing with students from across the county. Along with the honor, students have the responsibility of paying for transportation, lodging, meals, and a week’s worth of official dress. The funds raised will be divided equally among SD students who participate in this year’s National Band, Chorus or Talent. Click here to donate to this talented group.